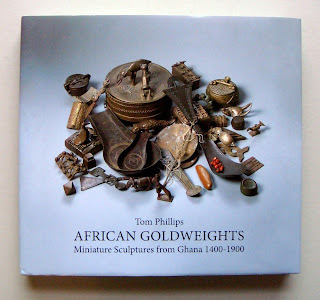 Back from Berlin after the launch of 'African Goldweights' at the Barbara Wien Gallery. The show looked handsome and I am happy with the book, yet another collaboration with Hansjorg Mayer, my publisher for forty years. Sad however to miss the Australian tennis final: I had to hold my breath until the TV highlights in the late evening to see who won. Predictably perhaps Heldenspieler Federer made our Murray look pretty ordinary. 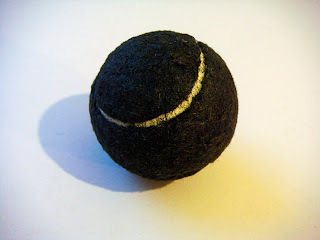 Coincidentally, the following morning I finished my black tennis ball. Tennis ball covered with hair, 2010.
the book looks fantastic!!! sheame we didn't coincide in berlin. "Coincidentally"? There are no coincidences, once you start dabbling in these black arts. Let's hope you didn't turn his balls to gun-stones.